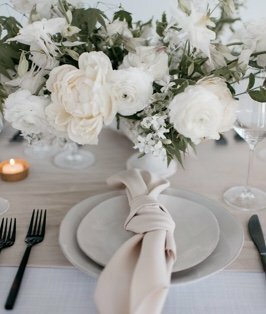 A modern, hip, and subtle foundation for any tablescape, this linen is composed of white lines that form undulating diamonds on a light mocha-colored background. It is inspired by the relaxed and simple pleasure of drinking a hot chocolate fireside after a long day on the slopes. It is sure to create a sophisticated and warm atmosphere for your event.